For $139 per pax, you get a 2 Way SilkAir Flight with 30kg Check-In Baggage (worth $388). 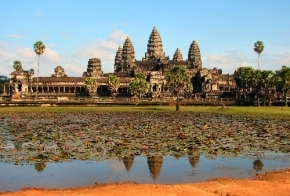 Pay tribute to Cambodia's rich culture and history, or unleash your inner Indiana Jones with a visit to Angkor Wat. Be awed by a sublime sunrise at the world's largest Hindu complex, and explore the stunning architecture and breathtaking array of traditional costumes donned by the locals. Or simply sit down and hear yourself think in this tranquil corner of Southeast Asia. Over at the Old Market, try your hand at bargaining while viewing more buildings in the area. Go on a hunt for traditional art pieces and other handmade knick knacks, such as handwoven hammocks to give your wardrobes and homes and old-world flavour. 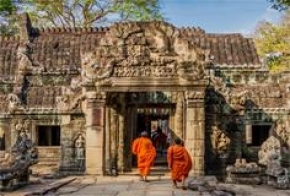 Don't forget to check out the Angkor National Museum to learn more about Cambodia's history, minus boring and dusty textbooks of course. And if you're feeling peckish in between your little adventures, slurp on some delicious local cuisine, from traditional fare like Amok Fish and Bahut to French fusion food if you're in the mood for something fancy. Fish Amok - Tender chunks of fresh fish immersed in a thick rich gravy, all assembled together in a fragrant banana leaf bowl, is as characteristically Cambodian as one can get. Using local ingredients like fresh coconut milk, slok ngor, tumeric root and lemongrass, this dish is bound to have diners hungry for more. Khmer Barbeque - Very similar to the famous Thai Barbeque (Mookata), this tantalizing and comforting meal is great for communal dining for an overload of meats and tasty spoonfuls of soup. Grill thin slices of marinated meat atop the mound of the barbeque, while vegetables simmer in the soup that fills the surrounding moat. Bai Sach Chrouk (Pork and Rice) - With a fuss-free name such as this, it is easy to see why this beloved dish has become a staple in the daily diet of a Cambodian. Mostly eaten for breakfast, this hearty set is bound to fill one up for the day ahead. Thinly sliced marinated pork is first grilled to perfection, then set atop a steaming plate of rice, complimented with a side of pickled root vegetables and washed down with a bowl of tasty chicken soup. Various Fried Insects - Ranging from tarantulas to crickets, visitors to Siem Reap's Old Market will find themselves bug-eyed at the assortment of cooked creepy crawlies. Strike off that number on your bucket list and sample some of these exotic snacks that are mostly grilled or deep-fried to crisp and crunchy perfection. Khmer Banana Curry - This exquisite mix of fruit and vegetables drenched in rich and mildly spicy curry sauce is perfect for those who enjoy a tinge of sweetness in otherwise savoury dishes. Best eaten with rice, the unique yet delicious dish is a must-try for those visiting the country.